Thanks to Line 6 and the Helix Floorboard multi-effects pedal, everyone has the opportunity to own a professional-grade guitar rig. Designed with an external case durable enough for touring and equipped with the internal processing power that's powerful enough for high-definition studio recording, the Line 6 Helix is possibly the most complete portable guitar rig ever built. 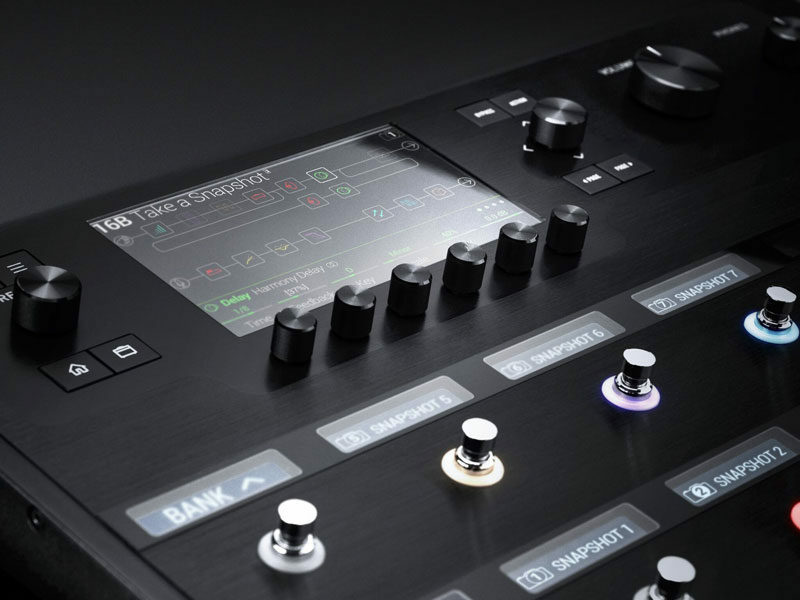 Line 6 continues to set the standard for guitar effects modeling through digital signal processing with Helix. Offering over 40 amp models, 30 cabinet models, and 16 microphone models, Helix can model over 20,000 speaker combinations right out of the box. Add in over 70 effect types which can be combined in a virtually endless combination of permutations and the Line 6 Helix grants you with literally millions of sonic possibilities for your electric guitar or bass. zZounds is an authorized dealer of Line 6 products. 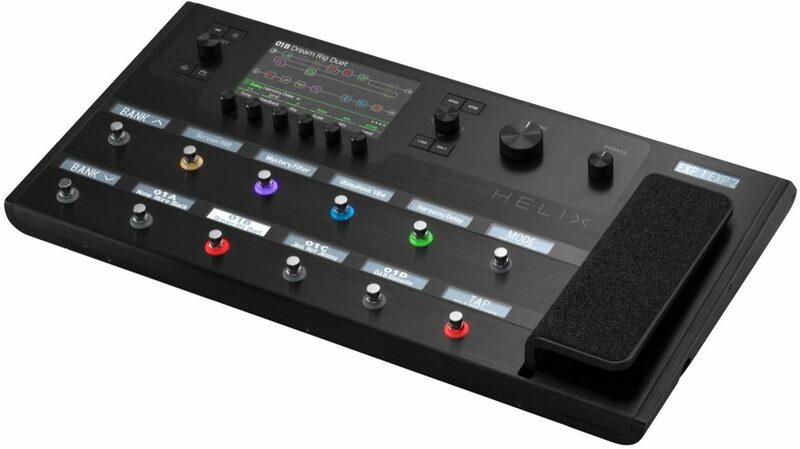 Helix is a new kind of guitar processor: it's not only a tour-grade multi-effect pedal that sounds and feels authentic, it's also the most comprehensive master controller for guitar systems ever built. Start by recreating the tones in your head with the new HX modeling engine - the new amps, cabs, mics, and effects will feel familiar to anyone who has ever spent time in the studio getting the best guitar sounds from both vintage and modern gear. Have a pile of oddball pedals that you rely on for your personal sounds? No problem. Take advantage of the most comprehensive I/O and routing capabilities ever built into a multi-effect and easily integrate them into the Helix environment. Once connected, create custom setups and footswitch labels that make your external pedals feel like they're all under the hood. Whether you spend your time in the studio or on the stage, Helix is the next-generation guitar processor you've been waiting for. When it comes down to authentic sound and feel, Helix represents a giant leap forward for guitar technology. The dual-DSP engine provides massive power to accurately recreate the dynamic feel of tube amplifiers, not just their sonic fingerprint. Each stage of an amp's circuit has been measured and matched back to the original, so that each model reacts and interacts just like the real thing. This level of dynamic circuit detail extends into areas like power supply ripple, individual tube sag, and control over B+ voltages. Once these elements are captured, you get classic bloom and gooey compression on some amps, and apowerful gut punch on others. Additionally, you can load custom impulse responses to personalize your rig setup. Helix 2.0 firmware introduces five amp models based on* the legendary Mesa/Boogie Mk IV and Marshall JCM 800, as well as distortion, EQ, modulation and delay effects. Massive power traditionally comes with a steep learning curve, but Helix challenges that way of thinking. Touch-sensitive footswitches allow you to select an effect block for editing simply by touching it. In combination, the large 6.2 inch 800x480-pixel LCD display all but eliminates menu-diving and provides the same level of control you would expect from an external editor. Colored LED rings and customizable scribble strips complete the user interface, letting you know what each footswitch is doing at a glance. When it comes to creating tones, Helix is as fast as you are. Part of the goal in developing Helix was to allow guitarists to interact with technology in ways that are more intuitive, making the creation of tones easier. This means that -- for the very first time -- you won't have to stop playing to tweak a knob. With Pedal Edit Mode, you can edit any parameter you like using your foot: simply select the block that you want to tweak, and its parameters spill out onto the footswitches. Select a parameter, and tweak the value using the expression pedal. 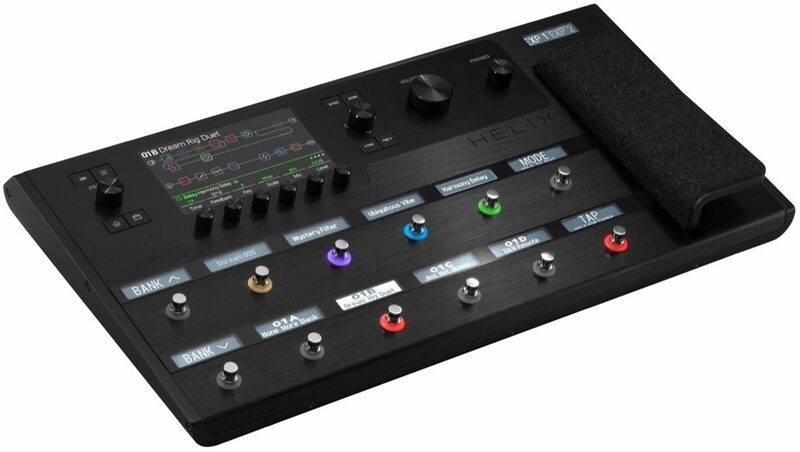 Giving you the ability to touch a footswitch and quickly tweak parameters or easily assign or learn controllers, Helix is the fastest tone creator of its kind on the planet. But that's only part of the story --it's also the most flexible. Helix has FOUR stereo paths per preset, allowing you to design complex routing scenarios for each patch. Creating variations on wet and dry routing schemes is as easy as loading a template or tweaking the joystick, and using the onboard effects models in conjunction with the 4 freely-assignable effects loops means that the tonal possibilities are truly huge. Helix 2.0 firmware includes the Snapshots performance feature, enabling you to instantly recall, switch, and control selected elements of your tone within individual presets. Depending on how they're set up, Snapshots can act as eight variations of the same tone, eight drastically different tones, or any combination thereof --all within the same preset. 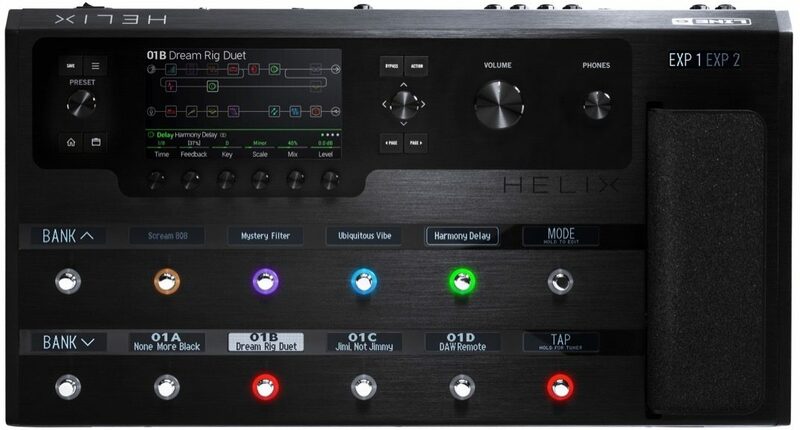 As the most advanced guitar processor ever made, Helix can become the nerve center for your entire guitar rig. Easily integrate traditional effects pedals and other hardware into your environment, creating a seamless hybrid rig that incorporates the best of what software and hardware have to offer. Helix has the most flexible audio routing ever seen on a guitar processor, thanks to its dynamically allocated DSP. Use the four effects loops to connect four separate pedal chains, or split them up and use them as freely-assignable inputs and outputs. In combination with four stereo paths, this means that you can process multiple instruments at once, send wet and dry signals to different places, and create large integrated systems that take advantage of both digital and analog I/O at the same time. When you need to incorporate external devices via MIDI, Helix offers more flexibility than any multi-effect ever. In addition to powerful real time MIDI control, Helix can send up to six separate commands at patch recall that aren't assigned to a footswitch, which means you can change a patch on a synth, start a sequencer, and turn up a fader on an external mixer, all with one press of a footswitch. Add three expression pedals, CV/Expression out, and external amp switching, and Helix can be the command center for any size rig. Finally, Helix 2.0 firmware features unique Variax control enhancements open up performance possibilities -- toggle between two guitar models with a footswitch, control the Variax tone knob with an expression pedal, assign a momentary footswitch to drop D, and more. Helix is like no other guitar pedal that you've ever seen before. It represents a new way of thinking about guitarists and technology, and it gives creative musicians the tools to quickly recreate the sound they hear their head, without sonic compromise. *All product names used herein are trademarks of their respective owners, which are in no way associated or affiliated with Line 6. These trademarks of other manufacturers are used solely to identify the products of those manufacturers whose tones and sounds were studied during Line 6's sound model development. Mesa/Boogie is a registered trademark of Mesa/Boogie, Ltd. Marshall and JCM are registered trademarks of Marshall Amplification Plc. BOSS is a registered trademark of Roland Corporation. "The Best Investment Of My Entire Rig!!!!" Overall: I have owned this now for a month. zZounds had it to me with no hiccups and thank God i was able to do the play as you pay!!! So here's all of the arsenal I've ever owned: I've owned a Marshall DSL 100, Blackstar HT40, Bean PODS of every kind, HD500, HD500X and a plethora of pedals from boutiques to you average DD-20 delay pedal. I've played through budget guitars all the way up to my Gibson Les Paul. So i've been blessed to have been able to explore the full spectrum of tones. I"m a worship pastor at my church and play live every Sunday and have also played at different churches when the band would go on the road at different "venue" style environments. Hands down, this is the best thing that Line 6 has ever done!!!! I literally just finished selling the final pieces of my pedals because I do not need them at all!!! The reaction and feedback from each string being hit and the feel of hearing it warm and authentic. The simplicity of setting up patches and assigning midi commands along with using the edit mode while playing not having to stop. All in all, yes this is expensive no doubt but I personally guarantee it that you wont regret it. If you are a mid-level to pro level guitarist, do not hesitate and bite the bullet. The tonality that this thing has is like i went into a music store and bought every piece of dream rig i could and have it all to my availability. I am not being paid by anyone to say this...I am floored and blown away at how she sounds...and to be honest, how she looks!!!! Some of the musicians walk by and stop and love the huge screen and the color coded buttons. DO NOT hesitate...if you're serious about your sound and want the authenticity of the real deal without having to break your back carrying everything or your wallet trying to buy a fraction of it, this is the way to go. Think about this!!!! If you were to buy 1 combo or half stack tube amp...then buy certain pedals that you know is part of your sound...then buy a specific mic to mic your gear...custom or separate jumper cables...possibly even get a good quality power brick...you can easily spend between $2,000 - $3,000 without trying. And that is just 1 amp...for the price of this pedal, you can get your moneys worth on one patch and then still have the entire library of amps, cabinets, mics and IR capabilities to mix and match as your heart desires and that's not including the effect and pedals it models. You want real authentic tone sound with the blessing of portability and price (considering what the real deal costs) and sound just as good as the real thing, invest in this peace of heaven. YOU WILL NOT REGRET IT!!! This review has been selected by our experts as particularly helpful. "First Impression Bad; Second Impression Fantastic"
Style of Music: Blues, rock, metal.